The project was designed to be provided in three phases for a total of 984 beds. Reuse of the 354 bed first phase along with a five story adaptation would complete the student residential quad. Phase I of the new student residential facility includes a mix of 4-bedroom single and 2-bedroom double apartments in a 7 story building to minimize rental risk and provide flexibility in housing assignments. 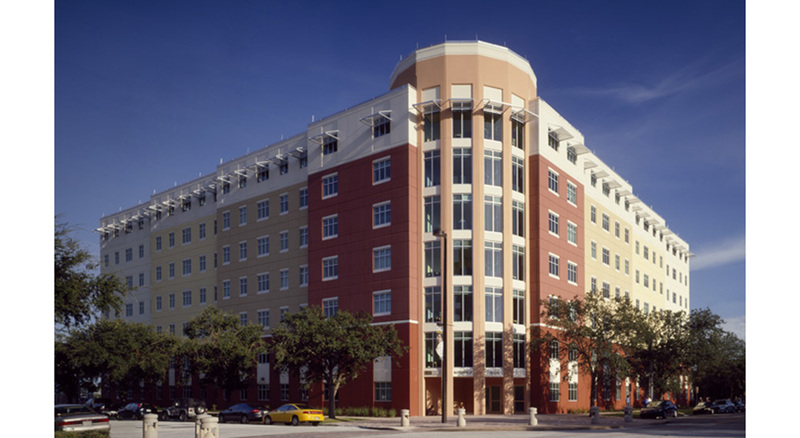 The 7 story structure is constructed on a rock column foundation system in lieu of auger piles due to soil voids inherent in the USF St. Pete area. Load bearing precast concrete walls for durability and sustainability. Floor design has free spanning precast double tees, again for durability and the economics of a single element system. This facility is designed for longevity, sustain-ability and durability with a proposed lifespan of fifty years. The character of the building is illustrated by a stepped back design for each facade. The facades progressively step back away from the street in three stages. Stepping of the facade aids in breaking up the horizontal length of the building. This provides a more pedestrian scale at the street level. 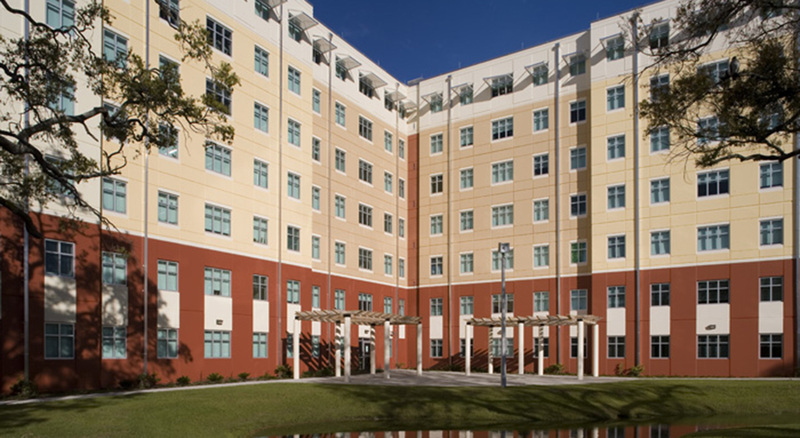 Each of the building steps are progressively painted a lighter color to further enhance the individuality of each step. The glazing is laminated glass in an aluminum frame designed to withstand hurricane winds and debris impacts. The main entrance to the building is at the corner of Fifth Avenue and Second Street. It is a rotunda shape representing a gateway to the campus and student living community. A site at the northeast corner of campus was selected for this use, which is consistent with the proposed amendment to the Campus Master Plan.